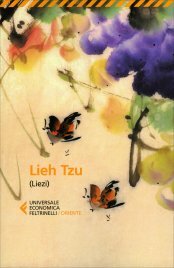 The third daoist classic, the Lieh Tzu, in my translation (in Italian) and commentary has been published by URRA/Feltrinelli in February 2014. The text of the Liezi (Lieh Tzu in Wade-Giles) or Chongxu zhide zhenjing (The True Classic of the Perfect Virtue of Emptiness) that has come down to us, accompanied by a commentary of Zhang Zhan, can be dated approximately at 370 CE. But a character named Lie Yukou or Liezi, ‘master (zi) Lie’, frequently appears in old daoist texts, particularly in the Zhuangzi, where it is said that he “travels riding on the wind”. Therefore Liezi, assuming he really existed, could have been a shaman philosopher living between the sixth and the fourth century BCE. But as far as the origin and dates of the texts that compose his book there is a wide uncertainty. It is possible that some of them are from the fourth century BCE or older, i.e. contemporary of their supposed author. But equally possible is that the text commented by Zhang Zhan is a late elaboration of pre-existing materials, and that the parallelism with various passages of the Zhuangzi are simply quotes taken from that book. A striking aspect of the character Liezi is the importance of the magic-shamanic dimension in the tales concerning him. Liezi appears, both in his own book and in the Zhuangzi, sometimes as a shaman-philosopher, sometimes as a young adept, charmed and almost bewitched by the attraction of magic. Philosophical daoism walks a fine line between a literal and a metaphorical reading of these portents. On one hand it looks with ironic detachment upon this fascination with magic, on the other it never completely parts ways with it. Liezi is typical in this respect: real or imaginary as he may be, it is in him that daoism fully explores this contradiction.